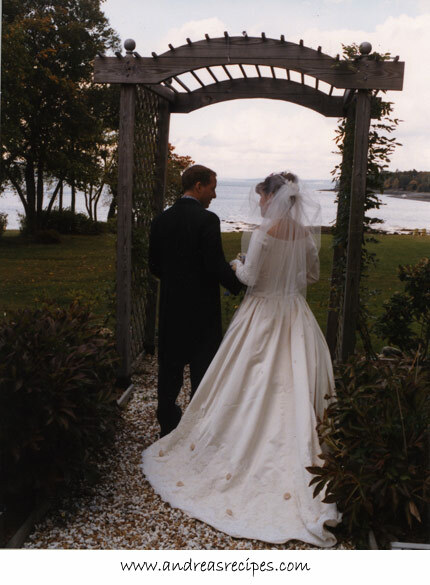 Eight years ago today, we said our vows on the lawn of the Bar Harbor Tides overlooking Frenchman’s Bay in Bar Harbor, Maine. We had planned to elope, but just two weeks before decided to invite our parents to our nuptials. It was a simple ceremony, no cake or reception, though the wonderful owners of the inn gave a champagne toast. Afterward we drove around Acadia National Park for our wedding photos. Happy Anniversary to my wonderful husband, Michael. Thank you for being a loving and supportive husband and caring, involved father. May we have many more years together. We just celebrated the 1-year marker for our engagement on 10/7. Congrats and Happy Anniversary. Your dress is stunning. It’s a shame you can’t find long-sleeved gowns anymore (a friend of mine is getting married in Jan. and had to settle on buying a wrap since, according to the wedding industry, you’re apparently no longer allowed to get married if it’s cold out). Jen, thank you and congrats to you, too! Jen Yu, aww, thanks for the good wishes. De in D.C., thank you. Even back then I had to look really hard to find a gown with long sleeves. And I was still freezing when we got to the top of Cadillac Mountain! Your dress is incredible. You were able to find that and have it fitted in less than 2 weeks? Amazing! Congrats on your Anniversary. Love your dress. It’s gorgeous! Happy Anniversary! Two years ago today, my wonderful husband and I got married at Clay Hill Farm in Oqunquit, Maine… Looks like you had as beautiful a Maine day as we had… Being a life long Mainer, there is no place better to be this time of year! I have enjoyed your blog and feel even more connected now! Just Beautiful! Congratulations to you both… hubby and I have been married 8 and a half years and today celebrate 11 years and one week “together”, each new day is a true blessing, may you share many! Congratulations to you and to your husband, and many many more years of happiness. Aw gee, that is just so sweet. Love the photos. Awww – you look so sweet in the photos. My husband and I celebrated 34 years together last December (I got married when I was 3). May you and your wonderful Michael enjoy 8 times 8 years of bliss together. After that, may every year bring its own blessings of joy and contentment as you grow together into the best there is to be. happy anniversary a few days late…you made a beautiful bride! I found you from Roni’s site (I love recipes!). I actually got married Oct. 7, 2006 so we just celebrated our 2nd anniversary. I love the pictures! Congratulations Andrea! so sorry I’m late. This is really a lovely loving post. Congratulations. What did you do for your anniversary? We just celebrated our 8th anniversary with a dinner at Chez Panisse. Andrea, congratulations on your anniversary, we celebrated our 9th anniversary just yesterday, and the style of celebration was exactly like yours.